The 80edays 2016, also known as the ELDURO, is an endurance race around the world with only all-electric vehicles – mainly Tesla Roadsters and Model S sedans. 14 international teams will rally across 25,000 km, 20 countries, and 3 continents to finish in Barcelona in 80 days or less. The race started this weekend in Barcelona and all the teams reached Lisbon in Portugal. They will fly the vehicles over the Atlantic ocean and continue the race in Nova Scotia, Canada. They will also collect interesting data on how the vehicles perform in different road and weather conditions considering they will literally travel around the world – see the route above. 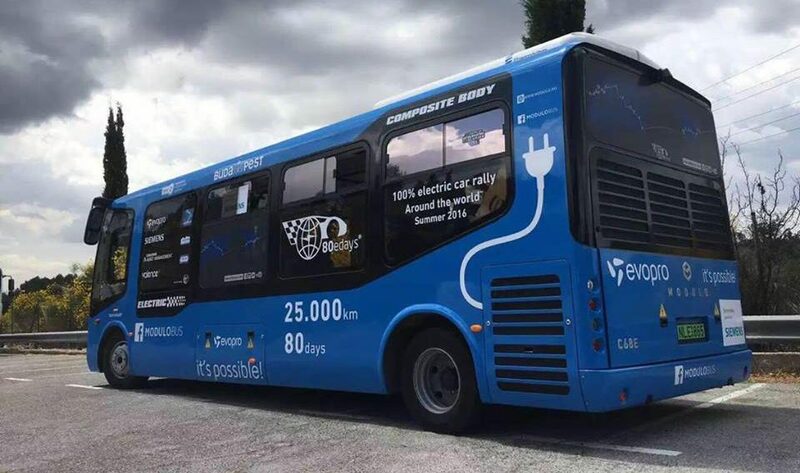 Almost all the teams are using either a Tesla Roadster or a Tesla Model S, but one team from Hungary is actually racing in an all-electric bus. The vehicle is equipped with a 141 kWh battery pack and can travel up to 350 km on a single charge. You can follow each time on a real-time map on their website. You can also see a list of the teams from around the world here.